The Illini Bass Fishing Club is a registered student organization of The University of Illinois Champaign-Urbana, founded in 2001 to bring together students who loved fishing. Since this time, the club has grown a strong competitive nature, sending members across the country competing in tournaments against other schools. Members of the I.B.F.C fish a number of different collegiate circuits including: the National Guard FLW College Fishing Series, the BoatUS Collegiate Circuit, the Mercury College Bass Championship on the national level, annual Big 10 Conference Championship, the Illinois Collegiate Championship among all Illinois college bass teams, and various other head to head tournaments against local clubs and schools. The club also has a non competitive side, staying true to our roots of our love for fishing. Our club regularly holds tournaments within the club on local ponds and lakes, where members fish against each other for bragging rights, and host numerous day-long trips to various lakes. The club itself owns two boats, a 1980 Fish and Ski I/O Ranger and a 14 ft Quachita. 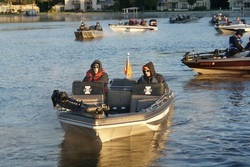 We are very fortunate to have our own club boats to use for both tournaments and fun fishing on local lakes such as Lake Shelbyville, Clinton Lake and Newton Lake. We are currently 35 members strong, with members representing a of variety different backgrounds, each bringing something unique to the team. The club encourages anybody who is interested in fishing, whether they have a lot of experience or not, to come check us out. Each year we have members join who have never fished a day in their lives and use the vast experience of all our members to teach everything from tying a knot to learning the endless different techniques for fishing!